What a wonderful question! I really wasn't sure what book to offer up - I haven't been blogging long enough to know which books older than a year or two received any attention. A quick look through my shelves had quite a few books popping out at me, so I did a quick search of each on the Book Blogs Search Engine. One of the books I chose had only one review, so I knew I had a winner. 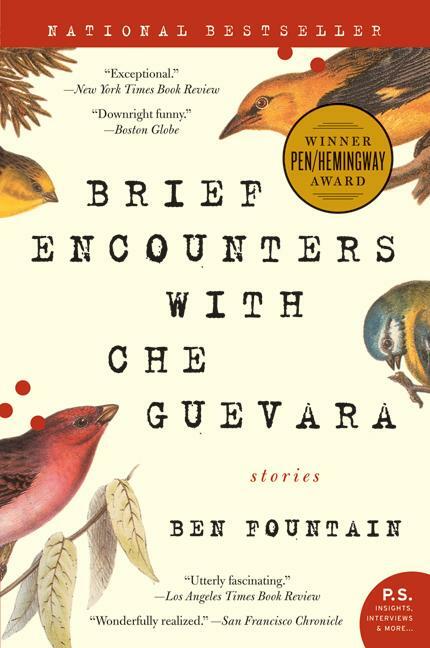 Brief Encounters with Che Guevara by Ben Fountain is a collection of short stories which reaches out and wrings compassion from my heart. This is one of the few books I've immediately wanted to include in one of my classes to help my students explore that current educational trend of global education. The settings of the stories range from Haiti to Sierra Leone to Columbia, and these settings drive plots which reveal the human situation in the midst of political and social upheaval. Sometimes funny and sometimes brutally sad, each story drew me in, made me question the good and evil in terrorists and freedom fighters, in tyrants and heroes, labels which are entirely the result of perspective. Fountain's writing is crisp and concise, and yet the level of detail offered really immerses the reader in a world of Fountain's creation. The settings, the characters, the stories themselves feel so amazingly authentic. And bizarre. Some of the situations portrayed in these stories easily slip over into the strange and sometimes even the dark, but even so, each story reads more like a non-fiction history than a fictional tale. If you haven't had the chance to read this yet, you should run out and get yourself a copy as soon as possible. I've not read this, but after watching The Motorcycle Diaries (which I had to watch multiple times because I loved it so much) I would pick this up in a minute. I will pick this up! Here is my BBAW: Forgotten Treasures post! I have heard very little about this book, but it does sound very interesting. I am going to have to try to find a copy. Thanks for sharing this little known gem! I doubt I will find a copy but it will turn up eventually. Have made a note of this book. Thanks. Wow, this one looks fantastic. And can I be shallow and rave about the cover? Beautiful! My bookshelves (and wallet) are going to groan after today. I've placed this one on my wish list. Thanks for the recommendation. New book to me, but definitely sounds really great. It's going on the wish list! This is a new one for me. The cover is gorgeous. I'll definitely have to give this book a try. Thanks for the recommendation!